People in Gotham are accustomed to hearing Batman jokes, but many aren't aware of its historical connection to the fictional Gotham City. So how did a sleepy Nottinghamshire settlement lend its name to a city of crime and corruption? Gotham is now a friendly village popular with families, but a few hundred years ago its residents had a reputation for "madness". One story goes that King John, also the villain in the legend of Robin Hood, was due to travel through Gotham on his way to nearby Nottingham. Any road the king travelled on would become a public highway, so the villagers are said to have feigned madness to deter the king - as it was thought to be infectious. Their absurd acts included building a fence around a bush to prevent a cuckoo escaping, and attempting to drown an eel in a pond. The trick worked, leading to the saying: "There are more fools pass through Gotham than remain in it." Villagers were also dubbed the Wise Men of Gotham. Word of the supposedly foolish acts spread, and they were collected in various books including The Merie Tales of the Mad Men of Gotam, published in 1565. The American author Washington Irving became aware of the tales and was the first person to link Gotham in England with New York in the US. He repeatedly referred to Manhattan as Gotham when writing, in 1807, in the Salmagundi papers, a satirical periodical mocking New Yorkers. Gotham then became a popular nickname for New York City and is still used today, in shop names and notably at the Gotham Center for New York City History. Edwin G Burrows and Mike Wallace also explained how the name was adopted by New Yorkers in their book Gotham: A History of New York City to 1898. They said: "Manhattanites would not likely have taken up a nickname so laden with pejorative connotations - even one bestowed by New York's most famous writer - unless it had redeeming qualities, and indeed some of the tales cast Gothamites in a flattering light." Gill Hind, former chairman of Gotham Parish Council in England, tried for many years to have Gotham twinned with New York City. "We always knew there was some sort of a link but we wanted to have it verified, then we found out about the Washington Irving connection," she says. "We did think it would be so lovely to have have a sign at the beginning of the village saying 'Gotham, twinned with New York'." Although the city and village have not been twinned, the former mayor of New York sent a letter wishing Gotham well and acknowledging the link between the two places. Rudolph Giuliani wrote that it was "a pleasure to have this opportunity to acknowledge the cultural and historical link" between the two places. So how did the Batman stories come to be set in Gotham City, rather than New York? Batman made his debut in issue 27 of Detective Comics, in 1939. His setting was referred to as an unnamed "teeming metropolis" in issue 29, but by issue 31 it was explicitly identified as "New York". Writer Bill Finger said he changed the name to Gotham after looking through a phone book and seeing the name Gotham Jewelers. While Gotham village is pronounced goat-em, stemming from "goat town", the pronunciation goth-am was adopted for Batman. The link with Nottinghamshire has only been acknowledged by Batman writers in recent years. In a story called Cityscape, written by Dennis O'Neill in The Batman Chronicles #6 in 1996, a villain plotting murder explains how the Gotham of the Batman universe was created. He enlists the help of an innocent man to build an asylum in the forest outside the town of Bludhaven, and proposes naming it Gotham "after a village in England where, according to common belief, all are bereft of their wits". In 2006, Justin Gray wrote about the King John story in Legends of the Dark Knight #206, saying that his couriers "found lunatics running wild in the streets" when they arrived in the village of Gotham. 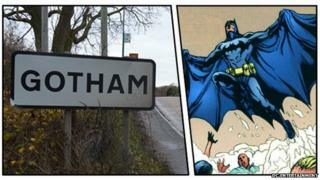 Given the link, Batman fans might be expected to flock to Gotham. Mrs Hind says this doesn't happen, but some of the cast of Batman Live did visit Gotham in 2011 for a photocall when the touring production came to Nottingham. A sculpture representing some of the legends of Gotham was unveiled in the village in September, and features Batman climbing up the side. "If you say you come from Gotham people say 'Oh, Gotham City?' and we always smile," Mrs Hind adds. "It's always been tongue in cheek but people haven't known that there's a proper reason for it."